Hemlock Hills, July 3. For nearly a week we have been sauntering through this most entrancing hill country, practically a pedestrian trip, except that the feet that have taken the steps have been shod with steel instead of leather. Your last chronicle has followed me, and was read in a region so pervaded by ferns that your questions concerning their transplanting would have answered themselves if you could have only perched on the rock beside me. There is a fern-lined ravine below, a fern-bordered road in front; and above a log cottage, set in a clearing in the hemlocks which has for its boundaries the tumble-down fence piled by the settlers a century or two ago, its crevices now filled by leaf-mould, has become [at once a natural fernery and a barrier. Why do you not use your old wall in a like manner? Of course your stones may be too closely piled and lack the time-gathered leaf-mould, but a little discretion in removing or tipping a stone here and there, and a crowbar for making pockets, would work wonders. You might even exchange the surplus rocks for leaf-mould, load by load; at any rate large quantities of fern soil must be obtainable for the carting at the reservoir woods. Imagine the effect, if you please, of that irregular line of rocks swathed in vines and sheltering great clumps of ferns, while it will afford an endless shelter for every sort of wild thing that you may pick up in your rambles. Of course you need not plant it all at once, but having made the plan, develop it at leisure. You should never quite finish a country place unless you expect to leave it. The something more in garden life is the bale of hay before the horse's nose on the uphill road. Last year, for almost a week, we thought our garden quite as finished as the material and surroundings would allow, - it was a strange, dismal, hollow sort of feeling. However, it was soon displaced by the desire that I have to collect my best roses in one spot, add to them, and gradually form a rosary where the ' Garden Queen and all her family may have the best of air, food, and lodgings. You see I feared that the knoll, hardy beds, and rose garden were not sufficient food for your mind to ruminate, so I add the fern fence as a sort of dessert! "An endless shelter for every sort of wild thing." "Where is the shade that ferns need?" I hear you ask, "for except under some old apple trees and where the bird cherries grow (and they, though beautiful at blooming time and leaf fall, attract tent caterpillars), the stone wall lies in the sun 1"
Yes, but in one of the woodland homes of this region I have seen a screen placed by such a rustic stone fence that it not only served the purpose of giving light shade, but was a thing of beauty in itself, dividing the vista into many landscapes, the frame being long or upright according to the planter's fancy. Do you remember the old saying "When away keep open thine eyes, and so pack thy trunk for the home-going?" On this drive of ours I've been cramming my trunk to overflowing, and yet the ideas are often the simplest possible, for the people of this region, with more inventive art than money, have the perfect gift of adapting that which lies nearest to hand. You spoke in your last chronicle of the screen of white birches through which you saw the sun rise over the meadows of Opal Farm. This birch springs up in waste lands almost everywhere. We have it in abundance in the wood lot on the side of our hill, and it is scattered through the wet woods below our wild walk, showing that all it needs is a foothold. Because it is common and the wood rather weak and soft, landscape gardening has rather passed it by, turning a cold shoulder, yet the slender tree is very beautiful. True, it has not the length of life, the girth and strength of limb, of the silver-barked canoe birch, but the white birch will grow in a climate that fevers its northern cousin. In spite of its delicate qualities, it is not a trivial tree, for I have seen it with a bole of more than forty feet in length, measuring eighteen inches through at the ground. When you set it, you are not planting for posterity, perhaps, but will gain a speedy result; and the fertility of the tree, when once established, will take care of the future. What is more charming after a summer shower than a natural cluster of these picturesque birches, as they often chance to group themselves in threes, like the Graces - the soft white of the trunks, with dark hieroglyphic shadows here and there disappearing in a drapery of glossy leaves, green above and reflecting the bark colour underneath, all a-quiver and more like live things poised upon the russet twigs than delicate pointed leaves! Then, when the autumn comes, how they stand out in company with cedar bushes and sheep laurel on the hillsides to make beautiful the winter garden, and we stand in mute admiration when these white birches reach from a snowbank and pencil their frosty tracery against a wall of hemlocks. This is the simple material that has been used with such wonderful effect. 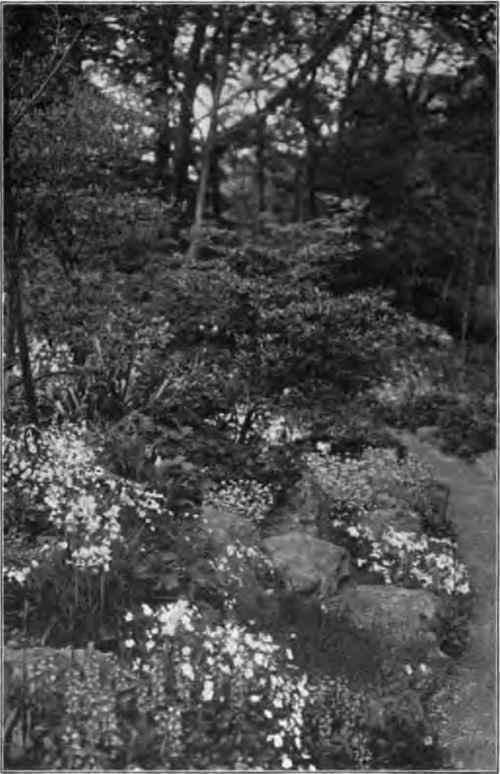 In the gardens hereabout they have flanked their alleys with the birches, for even when fully grown their habit is more poplar-like than spreading, and many plants, like lilies, requiring partial shade flourish under them; while for fences and screens the trees are planted in small groups, with either stones and ferns, or shrubs set thick between, and the most beautiful winter fence that Evan says he has ever seen in all his wanderings amid costly beauty was when, last winter, in being here to measure for some plans, he came suddenly upon an informal boundary and screen combined, over fifty feet in length, made of white birches, - the groups of twos and threes set eight or ten feet apart, the gaps being filled by Japanese barberries laden with their scarlet fruit. Even now this same screen is beautiful enough with its shaded greens, while the barberries in their blooming time, and the crimson leaf glow of autumn, give it four distinct seasons.